Growing evidence from neuroscience and, particularly, functional magnetic resonance image (fMRI)1–6 has allowed us to construct a neuroscientific study to explain the neurobiological mechanism present in any human behavior. According to this study, any human behavior takes place with the interactive concurrence (in parallel) of two cerebral simultaneous processes: 1) the cognitive data processing of information and 2) the processing of sensitive feeling. Part of this, and particularly relevant, is the processing of danger feeling that is equivalent to insecurity, fear, or unconfident sensitivity and also equivalent to painful emotional processing in neurobiological terms. Data information processing can be synonymous with cognitive processing. With regard to this process, there is a conceptual and operational framework provided by the Planning, Attention-Arousal, Simultaneous and Successive (PASS) theory of information processing to explain a cognitive intelligent behavior.11–13 This conception says strategies (planning) work more unconsciously than consciously, which is a substantial point for our framework. In this aspect, we can mention the cognitive psychological evidence that demonstrates the dissociation between self-verbal report and action. That is, a child is solving a task and we can verify that the verbally reported (“a posteriori” abstract reasoning) strategy is not the one actually being used, which we can deduce by observing the eye movements. That is, the unconscious strategy may be opaque to introspection. For example, the child is solving a task of searching for a number embedded in a field of other numbers. When asked how the target was located, we can see that screening eye movements tell us a different action than that verbally reported. Similarly, in experiments with adults, adult subjects were asked to do decision-making tasks, and a dissociation between verbal report and action has been noticed frequently. We understand that the verbalization is an a posteriori mental process. First, central unconscious processing takes place, and then verbalization arguing for the supposedly used strategy happens, which is elaborated later. The brain initially creates a reasonable response by using its previously accumulated knowledge (knowledge base). If so, studies based on conscious self-verbal report may involve a relevant bias. Emotional activity occurs in parallel to cognitive processing. The fear of danger processing is a line of emotional research of growing interest in the last decade;14–16 neuroscientific arguments being consistent enough to support the reality of these neurological mechanisms.17–27 Relevant nodes of cognitive network are the dorsolateral prefrontal, angular gyrus, and several regions of frontal, parietal, temporal, and occipital cortex. Similarly, relevant nodes of emotional feeling network are the thalamus, amygdala, posterior and anterior cingulate, and medial inferior ventral prefrontal. Therefore, dorsolateral prefrontal must be associated with cognitive processing, although some researchers link it to emotion in the sense of conscious cognitive regulation of emotion.28 Our research is in the field of another paradigm, but it is not faced with contradictory evidence in the field of neuroscience. A procedure that allows us objectively to test the unconscious processing will allow us to expand research on emotional effects on cognition to judgment and decision making. Our framework is based on cognitive and emotional interaction, the interplay between emotion and cognition, and we assume the paradigm that says emotional feeling is sensitivity, but not cognition. That is why we look for a design where stimulus (test) is demanding minimum cognitive (thinking) requirement. Self-reports are often not useful to explain why people experience what they do. That is why we intend to demonstrate this interaction objectively, the emotional and cognitive interface reactions to external stimulus on the basis that growing evidence in the literature tells us that exterior cognitive and interior emotional feeling network activate in a negative correlation. One network activity varies inversely with the other network activity. The more conscious component is working memory and the more external dorsal structure is also working memory, whatever cognitive emotional task is being processed. Conversely, the more unconscious component is working, the more the inferior interior structure works. For instance, a characteristic cognitive conscious structure is the dorsolateral prefrontal cortex that is responsible for working memory. Adolescents are an age group that is considered to have a number of peculiarities in their mental functioning. The aim of our study was to verify the hypothesis that adolescents would show oddities or differences with HEG when compared with adults in the operation of the neurobiological mechanism explained. The study group consists of 70 subjects (56 women and 14 men, 21–48 years old, mean 31.84, SD 10.65, standard error 0.31), who were university students of our University of Girona University, Faculty of Education and Psychology; Educational Psychology (n=20), Master of Diagnosis and Treatment in Neuropsicopedagogía (n=28), Master in Education in Diversity (n=7), and Teacher Training Master in Compulsory Secondary Education and Higher Secondary Education, Vocational Training and Language Education (n=15). The control group consists of another group of 59 subjects (28 women and 31 men), who were teenage students (13–14 years old) of third Compulsory Secondary Education. A structured interview developed for this purpose was used. Each case and control was assessed by two blinded researchers, and interobserver agreement of 80% was required. As needed, the following studies were carried out: ophthalmological exploration, otorrinolaringology exploration, video-electroencephalography, somnography, both auditory and visual event-related potential, cardiological examination, and thyroid study. Subjects were excluded if they had any disease and previous medications, and a medical screening was carried out to rule out any psychiatric or neurological illness. HEG (Biofeedback Institute, Los Angeles, CA) uses infrared light to measure the oxygenation through the skull, using the translucent property of the biological tissue for a wide range of wavelengths. Specifically, the near-infrared HEG (nirHEG) uses lights of red and infrared low frequency. The light source and the light receiver are mounted on a headband separated from each other by 3 cm. The device is designed to prevent interference of external light in measurements. The degree of muscle contraction does not affect the nirHEG measurement. Approximately 5%–10% of nirHEG readings come from the skin or cranial tissue. Reading is related to vascularization and blood volume in circulation. The nirHEG ratio of the received waves is the base of the blood flow. Therefore, the dependent variable of the study is changes in blood flow with changes in the oxygenated–deoxygenated hemoglobin ratio. The HEG device records this activity and translates it into conventional activity units that are used for comparisons in our study. Oxy-hemoglobin (Oxy-Hb) and deoxy- hemoglobin (deoxy-Hb) are not directly recorded. A higher value of activity translates to a higher level of blood flow that is considered an indirect indicator of neuronal activity. A standardized basis for HEG ratio was established by Fp1 measurements in 154 adults. Direct scores were standardized; something similar to the standardization of a psychological test. The standard reference value was set to 100 (SD =20) in order to calibrate all new spectrophotometers. Subjects were recruited from universities and secondary school institutes. Informed consent was obtained from all the subjects, and the study was approved by the IRB and Ethics Commitee Fundació Carme Vidal NeuroPsicoPedagogia. All subjects were given a questionnaire in order to exclude potential confounders. Exclusion variables were taking medication, smoking, alcohol consumption, and drugs. Neurological assessment was carried out as needed. Evaluation was made individually for each subject by a single researcher, and always the same researcher, in an isolated and properly conditioned room. The brain activity was recorded at the Fpz electroencephalographic point. At the beginning, a 30-second HEG record was registered to establish the baseline (minimal mental activity). To do this, each subject was asked to close his eyes and visualize the number 1, thus obtaining a homogeneous baseline measurement in all study subjects. Different images were continuously presented one after another by automated computer procedure; 16-second block of stimulation followed by a 30-second period of no stimulation. The variable rest period is used to decorrelate the timing of stimulus onset with spontaneous hemodynamic oscillations. To minimize the cognitive requirement, we used a quasipassive viewing procedure, which reduces the linguistic cognitive component of the task to a minimum. The presentation contained three types of images: a first block (images 1–5), which showed five bloody images (accidents and mutilations), a second block (images 6–10), in which five smiling and friendly faces were displayed, and finally a third block (images 11–15), in which five photographs of very malnourished persons appeared. All of them are images of emotional processing with different sign (valence) and level of emotional impact. It is about a valence-based approach in the sense of the intrinsic attractiveness (positive valence) or aversiveness (negative valence), taking into account the International Affective Picture System. Details of the images are available from the authors on request. We checked normal distribution adjustment by the Shapiro–Wilk test. Analysis of variance (ANOVA), one-way and two-way, was applied with post hoc comparisons; Games–Howell test (nonhomogenous variance) where appropriate. Differences were tested with F statistic. First of all, teenage students enrolled in secondary school (n=59) reported HEG activity levels below the baseline (baseline =640 activity units, Figure 2) across all 15 tests, as expected. This result holds across all tests that require emotional processing. 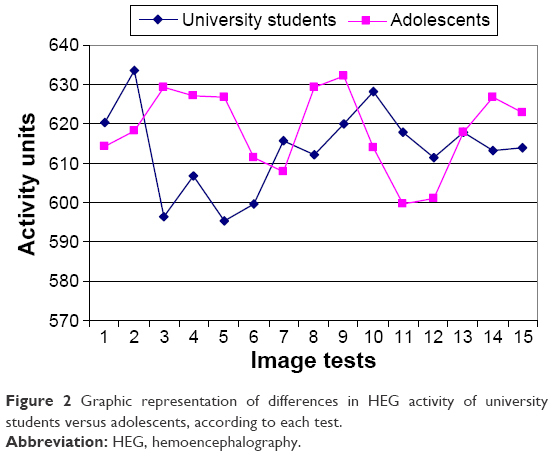 Figure 2 Graphic representation of differences in HEG activity of university students versus adolescents, according to each test. As shown in Figure 2, the HEG activity reported by the teenage students clearly differs from that of the university students (n=70). These differences are most marked in the first set of tests. Teenage students do not show a decrease in activity in these tests of the first set as would be expected from preferential activation of internal emotional network. 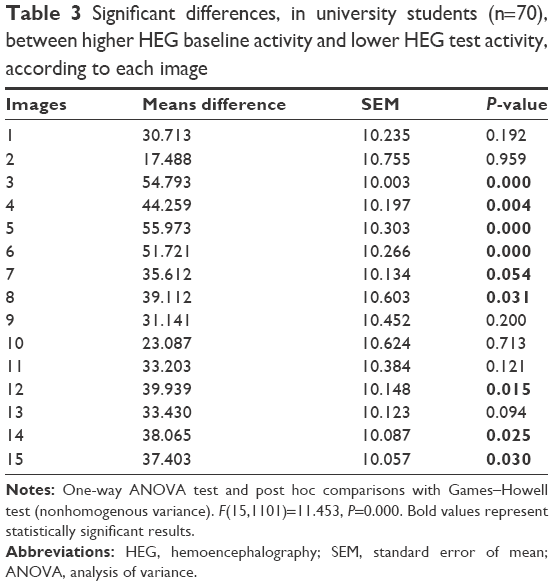 Table 1 reports the results of a two-way ANOVA with interaction between the sample and sets of images for HEG activity. The difference between the teenagers and university students is reported for each set of images, as well as their statistical significance. Adolescents showed lower decrease in activity. As previously mentioned, the difference in HEG activity between each group turns out to be very significant (P=0.0001) with regard to the first set of tests, which requires more processing of the fear of insecurity. The difference in HEG activity levels between teenagers and university students is not significant for the second and third sets of tests, which correspond, respectively, to satisfactory agreeable processing and fear of insecurity processing of less intensity than the first set. 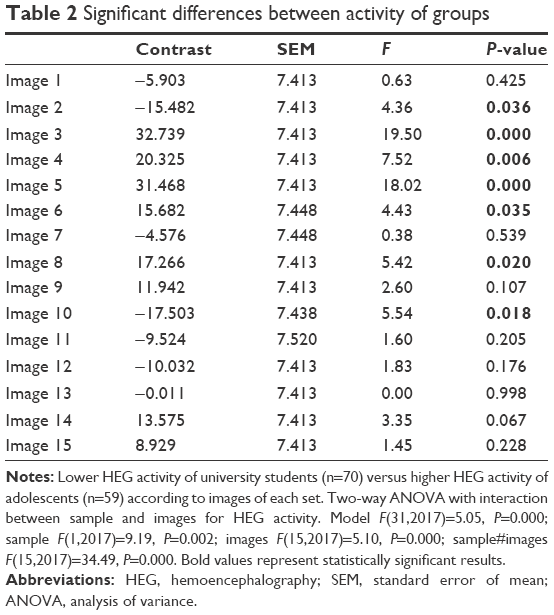 Notes: Lower HEG activity of university students (n=70) versus higher HEG activity of adolescents (n=59) according to set of images. Two-way ANOVA with interaction between sample and sets of images for HEG activity: model F(5,1923)=3.64, P=0.0028; sets F(2,1923)=0.77, P=0.462; sample F(1,1923)=9.91, P=0.017; set# sample F(2,1923)=3.44, P=0.032. Bold value represents a statistically significant result, P=0.0001. Abbreviations: HEG, hemoencephalography; SEM, standard error of mean; ANOVA, analysis of variance. We replicate the same analysis using a two-way ANOVA, including an interaction between the sample and each image (Table 2). For this part of the analysis, the difference between teenagers and university students is reported for each image. Statistical significance is confirmed with respect to the first set (images 2, 3, 4, and 5) and only the images 8 and 10 of the second set show statistical significance. That is, adolescent activity is higher than university student activity at statistically significant level, even in some tasks not demanding high level of insecurity of fear processing. 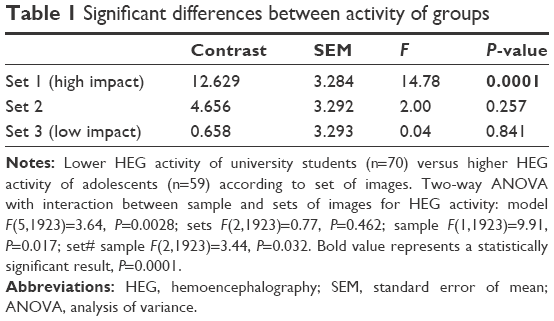 Notes: Lower HEG activity of university students (n=70) versus higher HEG activity of adolescents (n=59) according to images of each set. 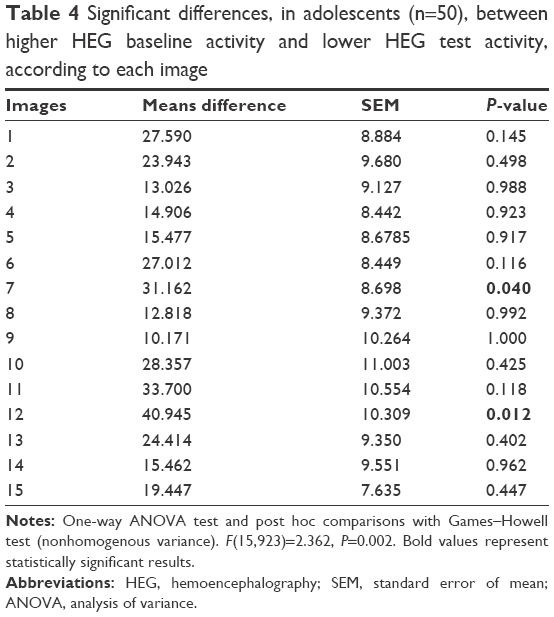 Two-way ANOVA with interaction between sample and images for HEG activity. Model F(31,2017)=5.05, P=0.000; sample F(1,2017)=9.19, P=0.002; images F(15,2017)=5.10, P=0.000; sample#images F(15,2017)=34.49, P=0.000. Bold values represent statistically significant results. We conducted an analysis of statistical significance comparing the values registered in condition of baseline and in condition of activity in the moment of the test. The university students (Table 3) showed lower values of activity with respect to baseline values in 1 (very unpleasant), 2 (pleasant), and 3 (unpleasant) sets of images as expected from the theoretical framework. The statistically significant level was higher in images of set 1, which demands higher insecurity of fear processing, lower external cognitive activity, and higher activity of emotional internal network. It can be interpreted that all tests determine a preferred internal emotional feeling network processing, regardless of the negative (insecurity of fear) or positive (safety-pleasure) valence. Notes: One-way ANOVA test and post hoc comparisons with Games–Howell test (nonhomogenous variance). F(15,1101)=11.453, P=0.000. Bold values represent statistically significant results. However, teenagers (Table 4) did not show the expected decrease in activity at statistically significant level, apart from image 7 (pleasant) and image 12 (unpleasant). Complete results are available from the authors upon request. Notes: One-way ANOVA test and post hoc comparisons with Games–Howell test (nonhomogenous variance). F(15,923)=2.362, P=0.002. Bold values represent statistically significant results. The first major conceptual premise to consider is that cognitive processing network is anatomically and functionally dorsal and exterior, while emotional and sensitive feeling processing network, including the classic limbic system, is predominantly interior and ventral. Countless neuroimaging studies confirm the identity of these two systems, the interior and exterior.1–6 The interior and ventral network is related to the functional system known in recent years as “default mode” in functional neuroimaging studies.3 The default mode is the predominant operating system when the conscious cognitive network goes into maintenance without purposeful tasks. It is understood that such state is the dominant processing that addresses our protection against hypothetical dangers. It can be inferred that although the two networks, exterior and interior, act in parallel, one or another predominates over the other depending on the circumstances. HEG will directly detect the exterior network and not directly the interior network. Conscious activity is more typical of cognitive processing, while the subconscious activity is more associated with emotional and sensitive feeling processing and, particularly, the processing of fear of danger feeling. The interior and ventral structures are older and support the defense mechanisms of protection against hypothetical dangers. We have evidence based on studies of prefrontal medioventral lesions according to which we decide (more subconsciously than consciously) in favor of the option that hurts less and not just as the result of a pure rational deliberative action.17 The medioventral lesion prevents us from feeling the consequences of the facts, and consequently, irrational decisions are made, although the predominant cognitive areas are intact.19,20 LeDoux’s studies showed that the processing of fear (danger) is governed by the temporal amygdala. For our purposes, the most relevant finding is that the frontal cerebral cortex activity triggered by the danger signal from the amygdala does not change when in later time the frontal cortex receives information of what is happening directly without passing through the amygdala. fMRI studies have demonstrated that the brain deceives itself on having given rational conscious explanations of the behaviors that it carries out. The brain applies explanations that make sense for the happened facts taking them of the memory without actually be the real explanation of the facts.22 Electrophysiological studies not based on fMRI have revealed that before being aware of the decision we made, there is an unconscious neural activity.18,21 Subsequently, fMRI studies have shown that there is a nonconscious brain activity up to 10 seconds before being aware of the decision.24 It is a proven fact that some decisions require no conscience at all.26,27 All this raises questions about the reliability of the self-verbal report to study the cognitive and emotional interface. Our HEG results show some aspect of emotion that is automatically noncognitive, predominantly independent of cognitive involvement, and support the role of unconscious processing. Similarly, they provide a means for understanding the cognitive and noncognitive contributions to emotion. They allow us to detect the predominant processing activity at all times linked to the exterior cognitive processing (HEG increased activity over baseline) or linked to the inner emotional and sensitive feeling (HEG decreased activity over baseline) processing. As part of the latter, it is very crucial for the processing of security–insecurity feelings. Already in 2012,30 it was found by HEG researchers that cognitive tests with neutral emotional burden were associated with increased activity above the basal activity, whereas the tests with emotional load, involving fear of danger and insecurity processing were associated with a decrease in HEG activity. That is, increased activity results in increased exterior prefrontal brain activity closer to the sensor detector, while a decrease in activity translates into minor activity of the same cerebral areas near the sensor. Most existing studies on emotional reactivity and regulation are based on data obtained through self-verbal report of the subject under study. With the currently existing knowledge on the cognitive processing of verbal reports subject to the emotional insecurity processing, the studies based on self-verbal report introduce a bias in the interpretation of the nature of the investigation process.37 As far as possible, having objective procedures is desirable. It is known that regulatory prefrontal areas are the last brain regions to mature in adolescence. Studies have shown that adolescents behave in disproportionately irregular form in decision making when they have to respond in the case of emotionally charged tasks.38,39 Our study, with an objective procedure, provides further evidence that adolescence is associated with a different cognitive and emotional processing. We do not think that emotion is too vague a concept to work with. A study comparing younger children and adolescents is desirable. It would also be desirable to conduct studies that could establish the usefulness of HEG in this age as a tool to detect risk of future clinical and psychiatric disorders such as depression and anxiety. There were limitations in the current study. A larger sample of participants might be more reliable to generalize the results to a larger population. Future studies could also include for the selection of the sample an administration of the Achenbach Child Behavior Checklist for the selection of the sample. A design with enough follow-up would allow us to verify the incidence of psychiatric disorders. HEG is able to detect cortical prefrontal activation. On the basis of neurological knowledge of two networks, one exterior cognitive and another internal emotional, working in parallel and operating in inversely proportional way, we postulate that this technique or procedure may be an objective tool of useful application in clinical practice to check the maturation acquired by people in this age range. Patterns of HEG might be correlated with cognitive emotional processing and behavior. The authors acknowledge the individuals who participated in this study. They express their deepest appreciation to the subjects and families who provided the possibility to complete this study. Also, to all professionals who contributed to this study in any way, such as statistical analysis, computational assistance, suggestions, comments, and encouragement. Cabeza R, Nyberg L. Imaging cognition II: an empirical review of 275 PET and fMRI studies. J Cogn Neurosci. 2000;12:1–47. Greicius MD, Krasnow B, Reiss BA, Menon V. Functional connectivity in the resting brain: a network analysis of the default mode hypothesis. Proc Natl Acad Sci U S A. 2003;100:253–258. Raichle ME, Snyder AZ. A default mode of brain function: a brief history of an evolving idea. Neuroimage. 2007;37:1083–1090. Pujol J, Reixach J, Harrison BJ, Timoneda-Gallart C, Vilanova JC, Perez-Alvarez F. Posterior cingulote activation during moral dilemmas. Hum Brain Mapp. 2008;29:910–921. Perez-Alvarez F, Perez-Serra A, Timoneda-Gallart C. A better look at learning: how does the brain express the mind. Psychology. 2013;4:760–770. Pérez-Álvarez F, Timoneda-Gallart C. Intelligent behavior and neuroscience: what we know – and don’t know – about how we think. In: Papadopoulos TC, Parrila RK, Kirby JR, editors. Cognition, Intelligence, and Achievement: A Tribute to J. P. Das. New York, NY: Elsevier Inc; 2014:419–442. Carmen JA. Passive infrared hemoencephalography: four years and 100 migraines. J Neurother. 2004;8:23–51. Toomim H, Carmen J. Hemoencephalography: photon-based blood flow neurofeedback. In: Budzinsky TH, Budzinsky HK, Evans JR, Abarbanel A, editors. Introduction to Quantitative EEG and Neurofeedback. Advanced Theory and Applications. 2nd ed. New York, NY: Academic Press; 2009:169–194. Steiner NJ, Frenette EC, Rene KM, Brennan RT, Perrin EC. In-school neurofeedback training for ADHD: sustained improvements from a randomized control trial. Pediatrics. 2014;133:483–492. Vasquez M, Gadea M, Garijo E, Aliño M, Salvador A. Effects of assisted training with neurofeedback on EEG measures, executive function and mood in a healthy sample. An Psicol. 2015;31:317–323. Das JP, Kar R, Parrila RK. Cognitive Planning. The Psychological Basis of Intelligent Behavior. London: Sage; 1996. Pérez-Álvarez F, Timoneda C. Assessment of cognitive processes: the basis of intelligent behavior. In: Lange MA, editor. Leading-Edge Psychological Tests and Testing. Hauppauge, NY: Nova Science Publishers; 2007:1–25. Mayoral-Rodriguez S, Timoneda-Gallart C, Perez-Alvarez F, Das JP. Improving cognitive processes in preschool children: the COGEST program. Eur Early Child Educ Res J. 2015;23:150–163. Power M, Dalgleish T. Cognition and Emotion: From Order to Disorder. London: Psychology Press; 1997. Pérez-Älvarez F, Timoneda-Gallart C. A Better Look at Intelligent Behavior. Cognition and Emotion. New York, NY: Nova Science; 2007. Pérez-Álvarez F, Timoneda-Gallart C. Mecanismos cerebrales implicados en la toma de decisiones. ¿De qué se trata? [The brain mechanisms involved in making decisions: what exactly are we talking about?]. Rev Neurol. 2007;44:320–321. Spanish. Damasio AR. Descartes’ Error. New York, NY: Putnam; 1970. Libet B, Gleason CA, Wright EW, Paul DK. Time of conscious intention to act in relation to onset of cerebral activity (readiness potential). The unconscious initiation of a free voluntary act. Brain. 1983;106:623–642. LeDoux JE, Farb CF, Ruggiero DA. Topographic organization of neurons in the acoustic thalamus that project to the amygdala. J Neurosci. 1990;10:1043–1054. LeDoux JE. The Emotional Brain. New York, NY: Simon & Schuster; 1996. Haggard P, Libet B. Conscious intention and brain activity. J Conscious Stud. 2001;8:47–64. Dobbins IG, Schnyer DM, Verfaellie M, Schacter DL. Cortical activity reductions during repetition priming can result from rapid response learning. Nature. 2004;428:316–319. Gazzaniga M. In: Glannon W, editor. Defining Right and Wrong in Brain Science. Vol. My brain made me do it. New York, NY: Dana Press; 2007:183–194. Soon CS, Brass M, Heinze HJ, Haynes JD. Unconscious determinants of free decisions in the human brain. Nat Neurosci. 2008;11:543–545. Ochsner KN, Gross JJ. Cognitive emotion regulation: insights from social cognitive and affective neuroscience. Curr Dir Psychol Sci. 2008;17:153–158. Dijksterhuis A, Aarts H. Goals, attention, and (un)consciousness. Annu Rev Psychol. 2010;61:467–490. Newell BR, Shanks DR. Unconscious influences on decision making: a critical review. Behav Brain Sci. 2014;37:1–19. McRae K, Gross JJ, Weber J, et al. The development of emotion regulation: an fMRI study of cognitive reappraisal in children, adolescents and young adults. Soc Cogn Affect Neurosci. 2012;7(1):11–22. Toomim H, Mize W, Yeekwong M, Toomim M, Marsh R, Kozlowski GP. Intentional increase of cerebral blood oxygenation using hemoencephalography (HEG): an efficient brain exercise program. J Neurother. 2004;8:5–22. Serra-Sala M, Timoneda-Gallart C, Pérez-Álvarez F. Evaluating prefrontal activation and its relationship with cognitive and emotional processes by means of hemoencephalography (HEG). J Neurother. 2012;16:183–195. Tajima-Pozo K, Yus M, Ruiz-Manrique G, Lewczuk A, Arrazola J, Montañes-Rada F. Amygdala abnormalities in adults with ADHD. J Atten Disord. Epub 2016 Mar 10. Silvers JA, McRae K, Gabrieli JDE, Gross JJ, Remy KA, Ochsner KN. Age-related differences in emotional reactivity, regulation, and rejection sensitivity in adolescence. Emotion. 2012;12:1235–1247. Luna B, Padmanabhan A, O’Hearn K. What has fMRI told us about the development of cognitive control through adolescence? Brain Cogn. 2010;72:101–113. Dahl RE. Adolescent brain development: a period of vulnerabilities and opportunities. Ann N Y Acad Sci. 2004;1021:1–22. Pine DS, Cohen P, Gurley D, Brook J, Ma Y. The risk for early-adulthood anxiety and depressive disorders in adolescents with anxiety and depressive disorders. Arch Gen Psychiatry. 1998;55:56–64. Glied S, Pine DS. Consequences and correlates of adolescent depression. Arch Pediatr Adolesc Med. 2002;156:1009–1014. Stafford T. The perspectival shift: how experiments on unconscious processing don’t justify the claims made for them. Front Psychol. 2014;5:1067. Cauffman E, Shulman EP, Steinberg L, et al. Age differences in affective decision making as indexed by performance on the Iowa Gambling Task. Dev Psychol. 2010;46:193–207. Colomer-Diago A, Miranda-Casas A, Herdoiza-Arroyo P, Presentación-Herrero MJ. Funciones ejecutivas y características estresantes de niños con trastorno por déficit de atención/hiperactividad: influencia en los resultados durante la adolescencia. [Executive functions and stressful characteristics of children with attention-deficit hyperactivity disorder: influence on behavioral problems during adolescence] Rev Neurol. 2012;64(suppl 1):S117–S120. Spanish.